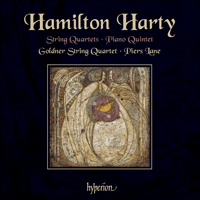 Acclaimed pianist Piers Lane and his fellow Australians, the Goldner String Quartet, reprise their highly successful partnership in these world-premiere recordings of the two String Quartets and Piano Quintet of Irish composer Hamilton Harty. Born in County Down, Harty (1879–1941) was a remarkable, self-taught musician who wrote in a lyrical Romantic idiom, as evidenced in these appealing works, while incorporating a modal astringency and folk-music charm that are reminiscent of Percy Grainger. In particular, the winding, pentatonic melody of the Lento of the Piano Quintet—a lusciously big-boned work worthy of Tchaikovsky—and the delightful 9/8 ‘hop jig’ of the first movement of String Quartet No 2 seem like settings of folk-melodies that have echoed for centuries around the green hills of Ireland. Intriguingly, however, they are entirely Harty’s own invention. Herbert Hamilton Harty was born in the village of Hillsborough, County Down in Northern Ireland on 4 December 1879. From a large and happy family, he was the fourth child (of ten) and third son of William Harty, the organist of St Malachy’s, Hillsborough, and a versatile all-round musician. William Harty ran the music in the local area of Lisburn, which included choral societies and instrumental concerts, and was highly regarded as one of the finest musicians in Ulster. The Gothic church of St Malachy’s, one of the finest of its type anywhere in Britain or Ireland, was built by the local aristocratic family of the Hills of Hillsborough Castle at the zenith of their wealth and influence. From the age of twelve or so, Harty was already playing the organ for services in the church, and it was here, almost certainly, that he developed his astonishing musicianship. At home he learned the piano under his father’s guidance and also the viola with moderate proficiency. Harty always claimed that his father was an outstanding musician and that he was one of the finest and most outward-looking of his generation in Ireland. This was borne out, so Harty maintained, by the extraordinary music library he possessed. The availability of this library to the young, self-taught Harty was more than enough to satiate his appetite. There was chamber music which various members of his family could play, with him contributing the viola part and his father the cello, and there was an abundance of piano music which ultimately became the focus of his studies away from his somewhat intermittent formal education at local schools. Harty’s prowess as an organist soon permitted him to look for church jobs away from Hillsborough, first at Magheragall in 1894, a few miles away, and in Belfast in 1896, but it was as the organist of Christchurch, Bray, between 1896 and 1901, that Harty’s enviable abilities as an accompanist blossomed. In nearby Dublin, musical activity was fast expanding under the aegis of the Italian pianist and composer Michele Esposito, who played a crucial role in the foundation of the Feis Ceoil in 1897, a distinctly national competitive music festival, and the Dublin Orchestral Society in 1899. Harty and Esposito probably met for the first time in 1899 when Harty elected to audition for the DOS. The Italian was not especially prepossessed by the Ulsterman’s proficiency as a violist but there was clearly a mutual respect for each other’s innate musical ability; and though Harty did not, as he claimed, become a formal pupil of Esposito, he nevertheless showed him everything he composed and the Italian was quite evidently an important influence in his early development as a composer (and later as a conductor). The Feis Ceoil played a vital role in Ireland’s cultural revival. Esposito earnestly campaigned for the festival to offer composition prizes in order to encourage the creative talent of native Irish citizens and those of Irish descent abroad. No doubt with Esposito’s encouragement, Harty entered his first chamber work, a Violin Sonata (now lost), in 1899. It did not win a prize, but the following year he was successful with his String Quartet No 1 in F major, Op 1, the first movement of which was played at the Feis. This Quartet was in fact not his first effort in the genre. An earlier work in A minor dates from March 1898 and may have been intended for the 1898 Feis, but it was probably not entered on account of its numerous flaws. By 1900, however, Harty’s technique had moved on appreciably. The first movement of the F major Quartet, full of invention and artifice, reveals if anything an over-ambition for developmental treatment in its zeal to explore new keys and new transformations. Yet one can detect a savoir faire in the handling of the quartet apparatus, and the melodic material is resourceful, bright and invigorating in its joie de vivre and contrapuntal dexterity. The will-o’-the-wisp scherzo in D minor, surely inspired by his knowledge of the late quartets of Beethoven and Mendelssohn, shows real flair in its quick-silver scoring and its love of tonal surprise, especially in the trio. The pastoral slow movement in B flat major is more expansive melodically and is richly scored. It also incorporates another surprise—the unexpected interpolation of the scherzo at its centre. The vivacious and technically demanding finale, which possesses musical ideas of lyrical interest and contrapuntal ingenuity, is an engaging if eccentric structure. Harty’s developmental phase begins in a remarkably chromatic manner (curiously suggestive of Bruckner) which leads with some surprise to a false yet extended recapitulation of the opening thematic material in E flat major. Even more unexpected, however, is the introduction of an entirely new episode before F major is restored for the final reprise, which has, by now, taken on the rhetorical mantle of a ‘rondo’ theme. Harty’s String Quartet No 2 in A minor, Op 5, was composed after he moved to London in March 1901. There he rapidly became the capital’s leading accompanist and was in considerable demand by the most prominent soloists of the day, among them Fritz Kreisler, Harry Plunket Greene and Agnes Nicholls (whom he married in 1904). Like the first Quartet, the second was a prizewinner, this time for the Dublin Feis of 1902 where it was successfully premiered on 8 May. Harty was in the audience to hear it played by his friends from the Royal Irish Academy of Music, Arthur Darley, P J Griffith, Octave Grisard and Henri Bast. Its second and last hearing (prior to the present recording) was given by four prominent London musicians, Alfred Gibson, Juliet Capron, Alfred Hobday and Helen Trust, on 22 December 1902 at Copped Hall, Totteridge, Hertfordshire, the home of Sir Harold Edwin Boulton, an amateur poet and music-lover. Revealing a marked advance on the first Quartet, this work, featuring a prominent ‘autobiographical’ viola part, is at once more fluent. The first movement evinces a greater sense of technical mastery of the quartet idiom, a feature, in fact, common to all four movements. The lilting ‘hop jig’ scherzo in 9/8, fertile in its dexterous manipulation of the hemiola, acts as a more vivid contrast with its trio in 2/4, while the slow movement imparts a more convincing sense of balance than its earlier counterpart in the first Quartet, as well as an intensely lyrical and more personal emotionalism at the climax. The imaginative finale, full of rhythmical élan, exhibits perhaps the most intricate writing for the quartet in the whole work, and the more embellished use of the slow movement’s second subject as secondary material is an effective cyclic touch. The appearance of this material in the unexpected and unconventional area of the subdominant reflects Esposito’s influence, but the most unusual introduction of new material—a chorale-like theme in F sharp minor—in the development and the much-truncated recapitulation reveal an entirely maverick streak of Harty’s personality which had been anticipated in the corresponding movement of the F major Quartet. In 1904 Harty embarked on the composition of another large-scale chamber work, the Piano Quintet in F major, Op 12, which he entered for a prize advertised by the immensely wealthy Ada Lewis-Hill, a well-known philanthropist and patron of the arts. Lewis-Hill was known for her love music. She endowed numerous instrumental prizes at the Royal Academy of Music, owned several valuable pianos and stringed instruments, among them numerous Stradivari. As Arthur Benjamin recollected, she ‘was a London woman of fashion and wealth … who was the queen of a kind of court, with musicians attached. Zillah was one of her maids-of-honour’, others being the Hungarian violinist Tivadar Nachéz and W H Squire, the cellist. In fact Nachéz and Squire formed part of a regular quintet ensemble which included the violist Alfred Hobday and the pianist Benno Schönberger who would often provide music for the benevolent patroness at her evening soirées. A prize for a piano quintet, which offered the princely sum of fifty guineas to its winner, therefore essentially paid tribute to the loyal players of the quintet which had for many years entertained Mrs Lewis-Hill (until her death in 1906). Schönberger, Mackenzie and Cowen were the adjudicators, and from a pool of almost forty compositions Harty’s Quintet was announced the winner in January 1905. After a private hearing at Mrs Lewis-Hill’s home, the Quintet was given its first public performance soon afterwards for the ‘Concert Club’ at the Bechstein Hall on 29 January 1905, with Enrique Fernández Arbós (the Club’s musical director), T F Morris, Alfred Hobday and Purcell Jones, Harty at the piano, although the surviving programme suggests that only the first and second movements were actually given. Possibly because the composer chose to revise it, the work was not performed again until 7 December 1906, when it formed part of a concert of British music given by the Concert-Goers’ Club at the Langham Hotel. This, it seems, was probably its only complete hearing in public. 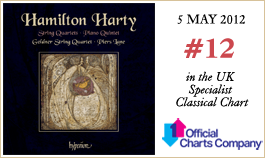 Harty’s Quintet is a bold, big-boned, passionate work of symphonic proportions and stands happily beside those large-scale Romantic utterances of Schumann, Brahms, Dvorák, César Franck, Fauré, Stanford and (later) Elgar in the same genre. This is music on a grand scale, full of melodic invention, where the idiom of piano and string quartet, susceptible to hybrid treatment, is dexterously manipulated polyphonically and antiphonally. With his established reputation as a pianist, Harty gave full prominence to the piano so that at times it competes with the strings like a concerto soloist. Harty’s concept of the first movement is indeed largely orchestral. A rhythmically dynamic idea, presented in unison by the strings, gives way to a spacious composite theme shared among the instruments and surrounded by elaborate filigree. In a manner akin to Schubert, this extended paragraph closes in F and yields to an equally generous second subject, a pentatonic, folk-inspired melody in the subdominant, by now a common choice in the tonal organization of Harty’s sonata schemes. This extended section also closes unequivocally in B flat, but not before Harty has subjected the self-developing theme to a colourful, not to say dramatic series of modulations which passes through the Neapolitan B major, and its dominant F sharp. The recovery from D flat major, established at the development’s climax, is impressively executed, and the restatement of the second subject, appropriately in D flat, is imaginatively handled as Harty uses the return to F, in turbulent mood, as a fresh means of thematic reworking. The restoration of the tonic is marked by triumphal piano fanfares, displaced from their normal position in the recapitulation, a strident manner later subdued by the tranquil interjections of the string quartet which set the tone for the reflective coda (in which the viola plays a conspicuous role on its lowest, most sonorous string). For the principal theme of his scherzo (assigned yet again to the viola), Harty resorted once more to a synthetic pentatonicism to create an ‘Irish’ theme, though this time the character of his material has a striking affinity with the arrangements of popular folk melodies by Percy Grainger. This is felt not only in the panache of the instrumentation—which is remarkably rich and vibrant, not least in the use of pizzicato—but also in the use of vigorous diatonic harmony, quirky modulations and countermelodies for which Grainger was renowned (in works such as Shepherd’s Hey, Handel in the Strand and the Irish reel Molly on the Shore). Harty’s structure, a beautifully crafted sonata, is also highly adroit, much skill being invested in the entertaining dialogue between piano and quartet in the development and in the playful and unexpected tonal divergencies. If an Irish flavour is evident in the scherzo, then it is palpable in the expressive heart of the work, the slow movement in A minor. Though no genuine Irish tune is quoted, Harty’s material throughout the movement is infused with a persistent flattened seventh (of the relative major, C)—a feature of Irish folk music—which pervades both the melody and the harmony. Harty had already demonstrated a fondness for elaborate melodic decoration in his ‘Irish’ Symphony, a work which won the Feis symphony prize in 1904, but here it is even more abundantly apparent in the use of mordents, rapid scales and modal inflection. Morever, in this context, Harty makes fertile use of the ‘double tonic’ phenomenon as the lengthy thematic material switches tantalizingly back and forth between A minor and C major. Concluding in C major, the first subject utilizes the flattened seventh enharmonically (the B flat being written as A sharp) enabling, through an augmented sixth, a deft modulation to E major for the second subject. This second subject, even more so than the first, is extensively self-developing, in the manner of Tchaikovsky’s sweeping thematic paragraphs. Introduced by the viola, it is initially presented against a background of countermelody at which Harty excelled, but at its grand, extrovert reprise—the use of a heroic 6–4 chord, the scoring for strings in multiple octaves, and the intensity of the triplet accompaniment—it is even more reminiscent of the Russian. In the last movement of the Quintet, Harty’s predilection for Russian music is confirmed in the lively second subject (which he must have unconsciously gleaned from Tchaikovsky’s first Piano Concerto) and in the highly unconventional episode in B flat minor that forms the centrepiece of the development; both ideas give the finale a burlesque character that is even more accentuated in the impetuous coda. This propensity for the exotic, as well as for vibrant instrumental colour, would feature time and again in Harty’s later work, and would also affirm his fascination for other late nineteenth-century Russians, such as Musorgsky, Lyapunov, Balakirev and Rimsky-Korsakov, who featured in his programmes as a conductor. Herbert Hamilton Harty naquit le 4 décembre 1879 dans une grande et heureuse famille de Hillsborough, un village nord-irlandais du County Down. Quatrième de dix enfants, il était le troisième fils de William Harty, organiste de St Malachy’s (Hillsborough) et musicien aux talents variés, qui dirigeait la musique dans la région de Lisburn, riche en sociétés chorales et en concerts instrumentaux. Très estimé, il était considéré comme l’un des meilleurs musiciens d’Ulster. Quant à St Malachy’s—parmi les plus belles églises gothiques de Grande-Bretagne et d’Irlande—, elle fut bâtie par les Hills du château de Hillsborough, une famille aristocratique alors au faîte de sa richesse et de son influence. Dès qu’il eut une douzaine d’années, Harty tint l’orgue pour les services liturgiques et ce fut très certainement à l’église qu’il développa son étonnante musicalité. Chez lui, il apprit le piano sous la direction de son père et l’alto, qu’il maîtrisa moyennement. Son père, affirmait-il sans relâche, était un musicien remarquable, l’un des meilleurs et des plus ouverts de sa génération et de son pays. Ce que confirmait, maintenait-il, son extraordinaire bibliothèque musicale. Plus que suffisante pour rassasier le jeune Harty, autodidacte, elle contenait de la musique de chambre jouable par plusieurs membres de la famille—lui à l’alto, son père au violoncelle—et quantité d’œuvres pour piano, sur lesquelles il axa ses études, en dehors de sa fréquentation, un rien intermittente, des écoles du coin. Ses prouesses d’organiste permirent bientôt à Harty de postuler pour des fonctions liturgiques ailleurs qu’à Hillsborough, d’abord à Magheragall (1894), à quelques kilomètres, puis à Belfast (1896) et enfin à Bray, où ses enviables aptitudes d’accompagnateur s’épanouirent à la tribune de Christchurch, de 1896 à 1901. Non loin de là, à Dublin, l’activité musicale connut un essor rapide sous l’impulsion du pianiste-compositeur italien Michele Esposito, qui contribua largement à la fondation du Feis Ceoil (un festival doublé d’un concours de musique clairement nationale), en 1897, et de la Dublin Orchestral Society, en 1899. Harty et Esposito se rencontrèrent probablement pour la première fois cette année-là, quand Harty décida d’auditionner pour la D.O.S. L’Italien ne fut pas spécialement impressionné par les qualités d’altiste de l’Ulstérien, mais chacun eut, à l’évidence, du respect pour les aptitudes musicales innées de l’autre; Harty ne devint jamais, comme il l’affirma, un élève officiel d’Esposito mais l’Italien, auquel il montra toutes ses compositions, exerça naturellement une énorme influence sur son développement naissant de compositeur (et, plus tard, de chef d’orchestre). Le Feis Ceoil fut pour beaucoup dans le renouveau culturel de l’Irlande et Esposito fit ardemment campagne pour qu’y fussent décernés des prix de composition à même de stimuler le talent créatif des Irlandais, de souche ou issus de la diaspora. En 1899, il encouragea sans doute Harty à soumettre sa première œuvre de chambre, une Sonate pour violin (aujourd’hui perdue) qui ne remporta pas de prix. Mais l’année suivante, il connut le succès avec son Quatuor à cordes nº 1 en fa majeur op. 1, dont le premier mouvement fut joué au Feis. En réalité, ce n’était pas la première fois qu’il s’essayait à ce genre: une œuvre en la mineur datant de mars 1898 a pu être destinée au Feis de cette année-là, mais elle était sûrement bien trop imparfaite pour être présentée. En 1900, toutefois, la technique de Harty s’était beaucoup améliorée et le premier mouvement du Quatour en fa majeur, tout d’invention et d’adresse, révèle même plutôt, dans le zèle qu’il met à explorer des tonalités et des transformations nouvelles, un trop-plein d’ambition dans le traitement du développement. Ce qui n’empêche pas un certain savoir-faire dans le maniement du quatuor en tant que tel; le matériau mélodique est, en outre, inventif, brillant, empreint d’une joie de vivre revigorante et contrapuntiquement habile. Le scherzo feu follet et ré mineur, assurément inspiré par les quatuors tardifs de Beethoven et de Mendelssohn, laisse apparaître un vrai don, perceptible dans l’écriture vif-argent comme dans l’amour de la surprise tonale, surtout dans le trio. Le pastoral mouvement lent en si bémol majeur, mélodiquement plus expansif, est richement instrumenté et intègre une autre surprise: l’interpolation du scherzo en son centre. Le finale vivace, techniquement exigeant, aux idées lyriquement intéressantes, est contrapuntiquement ingénieux et constitue une structure avenante, bien qu’un peu excentrique. La phase de développement, amorcée d’une manière remarquablement chromatique (chose curieuse, on pense à Bruckner) mène, non sans surprise, à une réexposition—fausse mais prolongée—du matériau thématique inaugural en mi bémol majeur. Encore plus inattendue, cependant, est l’introduction d’un tout nouvel épisode avant le rétablissement de fa majeur pour la dernière reprise, laquelle revêt alors l’habit rhétorique d’un thème de «rondo». Harty rédigea son Quatuor à cordes nº 2 en la mineur op. 5 après s’être installé à Londres (mars 1901), où il s’imposa vite comme le principal accompagnateur, fort prisé des plus éminents solistes de l’époque, notamment Fritz Kreisler, Harry Plunket Greene et Agnes Nicholls (qu’il épousa en 1904). Comme le précédent, ce Quatuor remporta un prix, cette fois au Feis de Dublin où il fut crée, avec succès, le 8 mai 1902. Harty se tenait dans le public pour l’entendre joué par ses amis de la Royal Irish Academy of Music, Arthur Darley, P. J. Griffith, Octave Grisard et Henri Bast. Quatre grands musiciens londoniens—Alfred Gibson, Juliet Capron, Alfred Hobday et Helen Trust—l’interprétèrent une seconde et dernière fois le 22 décembre 1902 au Copped Hall de Totteridge, dans le Hertfordshire, fief de Sir Harold Edwin Boulton, poète amateur et mélomane. En nets progrès par rapport au précédent, ce quatuor, doté d’une saillante partie d’alto «autobiographique», est d’emblée plus fluide. Le premier mouvement, en particulier, montre une bien meilleure maîtrise technique du style quatuor—un trait qui vaut, au vrai, pour les quatre mouvements. L’allant scherzo «hop jig» à 9/8, fécond en son habile manipulation de l’hémiole, contraste plus vivement avec le trio à 2/4; le mouvement lent, lui, insuffle un équilibre plus convaincant que dans le Quatuor nº 1, ainsi qu’une sensiblerie intensément lyrique, plus personnelle, à l’apogée. Le final imaginatif, plein d’élan rythmique, présente peut-être l’écriture de quatuor la plus complexe de toute l’œuvre, et l’usage fiorituré du second sujet du mouvement lent, en guise de matériau secondaire, constitue une impressionnante touche cyclique. L’apparition de ce matériau dans la région inattendue, peu conventionnelle, de la sous-dominante, trahit l’influence d’Esposito, mais la très insolite introduction d’un nouveau matériau—un thème façon choral en fa dièse mineur—dans le développement et la réexposition fort tronquée laissent apparaître un côté franc-tireur chez Harty, déjà perceptible dans le mouvement équivalent de son Quatuor en fa majeur. En 1904, Harty entreprit de composer une autre œuvre de chambre à grande échelle, le Quintette avec piano en fa majeur op. 12, qu’il proposa pour un prix lancé par la richissime Ada Lewis-Hill, célèbre philanthrope et mécène des arts. Connue pour son amour de la musique, elle dota maints prix instrumentaux de la Royal Academy of Music et possédait plusieurs pianos et instruments à cordes précieux, dont de nombreux Stradivarius. Arthur Benjamin se souvint: c’était «une femme du Londres de la mode et de la richesse … qui était la reine d’une sorte de cour, à laquelle étaient attachés des musiciens. Zillah comptait parmi ses demoiselles d’honneur», tout comme le violoniste hongrois Tivadar Nachéz et le violoncelliste W. H. Squire. En fait, ces deux derniers formaient, avec l’altiste Alfred Hobday et le pianiste Benno Schönberger, un quintette qui se produisait souvent dans les soirées de la bienveillante mécène. Un prix récompensant un quintette avec piano, doté de la princière somme de cinquante guinées, était donc avant tout un hommage aux fidèles membres de cette formation qui avait si longtemps diverti (jusqu’à sa mort en 1906) Mrs Lewis-Hill. Schönberger, Mackenzie et Cowen formèrent le jury et, parmi une petite quarantaine de compositions, ce fut le Quintette de Harty qui l’emporta, en janvier 1905. Après une audition privée chez Mrs Lewis-Hill, il fut bientôt créé en public pour le «Concert Club» au Bechstein Hall, le 29 janvier 1905, avec Enrique Fernández Arbós (le directeur musical du Club), T. F. Morris, Alfred Hobday et Purcell Jones plus Harty au piano, encore que le programme qui nous est parvenu suggère que seuls les deux premiers mouvements furent effectivement joués. Le compositeur décida de le réviser, et c’est peut-être pour cela qu’il ne fut pas rejoué avant le 7 décembre 1906, au Langham Hotel, dans le cadre d’un concert de musique britannique donné par le Concert-Goers’ Club. Ce fut, semble-t-il, sa seule exécution complète en public. Le Quintette de Harty est une œuvre audacieuse, très charpentée, passionnée, aux proportions symphoniques, qui ne dépare en rien les quintettes romantiques à grande échelle de Schumann, Brahms, Dvorák, César Franck, Fauré, Stanford et (plus tard) Elgar. Violà une musique d’envergure, gorgée d’invention mélodique, où le style du piano et du quatuor à cordes, supportant bien un traitement hybride, est habilement manié de manière polyphonique et antiphonée. Pianiste réputé, Harty fit la part si belle au piano qu’il rivalise parfois avec les cordes, tel un soliste de concerto. Au vrai, Harty donna au premier mouvement un tour essentiellement orchestral. Une idée rythmiquement dynamique, présentée à l’unisson par les cordes, cède la place à un vaste thème composite, partagé entre les instruments et cerné d’un filigrane complexe. À la Schubert, cet ample paragraphe termine en fa et s’éclipse devant un second sujet tout aussi généreux, une mélodie pentatonique, d’inspiration traditionnelle, à la sous-dominante—un choix qui était alors souvent celui de Harty dans l’organisation tonale de ses modèles de sonate. Cette section prolongée s’achève clairement en si bémol, mais pas avant que le thème autonome ait été soumis à une pittoresque, pour ne pas dire théâtrale, série de modulations passant par le napolitain si majeur, et son fa dièse de dominante. On se remet magistralement du ré bémol majeur, instauré à l’apogée du développement, et la réexposition du second sujet, dûment en ré bémol, est manipulée avec invention, Harty faisant du retour à fa, dans des turbulences, un nouveau moyen de réécriture thématique. Le rétablissement de la tonique est marqué par de triomphales fanfares pianistiques, bougées de leur place habituelle dans la réexposition—un procédé strident que réprimeront les paisibles interventions du quatuor à cordes donnant le ton à la méditative coda (l’alto y joue un rôle remarqué sur sa corde la plus grave, la plus sonore). Pour le thème principal de son scherzo (encore dévolu à l’alto), Harty recourut de nouveau à un pentatonisme synthétique pour créer un thème «irlandais», même si, cette fois, le caractère de son matériau présente une saisissante affinité avec Percy Grainger et ses arrangements de mélodies folkloriques populaires. Ce qui se ressent et dans le panache de l’instrumentation—remarquablement riche et vibrante grâce, surtout, au pizzicato—et dans l’emploi d’une vigoureuse harmonie diatonique, de modulations singulières et de contre-chants (autant d’éléments qui faisaient la renommée de Grainger dans des œuvres comme Shepherd’s Hey, Handel in the Strand ou encore le reel irlandais Molly on the Shore). La structure de Harty, une sonate merveilleusement ciselée, est aussi très habile, tout l’art ou presque tenant au divertissant dialogue piano/quatuor, dans le développement, et aux divergences tonales enjouées et inattendues. Le scherzo présente une évidente saveur irlandaise, perceptible dans le cœur expressif de l’œuvre, le mouvement lent en la mineur. Aucun air irlandais n’est vraiment cité mais, tout au long du mouvement, Harty imprègne son matériau d’une persistante septième bémolisée (du relatif majeur, ut)—une caractéristique du folklore irlandais—, qui envahit tout, la mélodie comme l’harmonie. Il avait déjà montré une propension à l’ornementation mélodique complexe dans sa Symphonie «Irlandaise» (prix de la symphonie lors de l’édition 1904 du Feis), mais ce goût est ici bien plus flagrant (mordants, gammes rapides et inflexion modale). Toutefois, dans ce contexte, il fait un fécond usage du phénomène de «double tonique», lorsque le très long matériau thématique oscille cruellement entre la mineur et ut majeur. Terminant en ut majeur, le premier sujet utilise la septième bémolisée de manière enharmonique (le si bémol est écrit comme un la dièse), ce qui permet, via une sixte augmentée, une habile modulation en mi majeur pour le second sujet. Celui-ci, plus encore que le premier, est très autonome dans son développement, un peu comme les amples paragraphes thématiques de Tchaïkovski. Présenté à l’alto, il est d’abord exposé avec, en fond, un contre-thème, point fort de Harty, mais sa grandiose reprise extravertie—marquée par l’usage d’un héroïque accord de sixte et quatre, l’écriture des cordes en octaves multiples et l’intensité de l’accompagnement en triolets—rappelle bien plus encore le Russe. Le dernier mouvement du Quintette confirme la prédilection de Harty pour la musique russe, que ce soit dans l’allègre second sujet (inconsciemment glané dans le Concerto pour piano nº 1 de Tchaïkovski) ou dans le fort peu conventionnel épisode en si bémol mineur au cœur du développement; ces deux idées confèrent au finale un caractère burlesque, encore accentué dans l’impétueuse coda. Cette propension à l’exotisme et aux vibrantes couleurs instrumentales ne cessera de hanter la musique de Harty et affirmera sa fascination pour d’autres Russes de la fin du XIXe siècle, tels Moussorgski, Liapounov, Balakirev et Rimski-Korsakov, tous inscrits aux programmes des concerts qu’il dirigea. Herbert Hamilton Harty wurde am 4. Dezember 1879 in dem nordirischen Dorf Hillsborough in County Down in eine große und glückliche Familie hineingeboren. Er war das vierte von insgesamt zehn Kindern und der dritte Sohn von William Harty, dem Organisten von St. Malachy’s in Hillsborough und einem vielseitigen Allroundmusiker, der das Musikleben in der Umgebung von Lisburn organisierte—etwa in Form von Gesangsvereinigungen und Instrumentalkonzerten—und als einer der besten Musiker in Ulster gerühmt wurde. St. Malachy’s, eine der schönsten gotischen Kirchen der britischen Inseln, war von der ortsansässigen aristokratischen Familie von Hillsborough Castle auf dem Höhepunkt ihres Reichtums und ihrer Macht erbaut worden. Bereits im Alter von 12 Jahren übernahm Harty in den Gottesdiensten das Orgelspiel und sicherlich entfaltete sich auch hier seine erstaunliche Musikalität. Zuhause erhielt er von seinem Vater Klavierunterricht und, mit mäßigem Erfolg, auch Bratschenstunden. Harty betonte stets, dass sein Vater nicht nur ein hervorragender Musiker, sondern einer der besten und vorausschauendsten seiner Generation in Irland gewesen sei. Dies bestätigte sich auch, so Harty, in der ungewöhnlichen Notenbibliothek seines Vaters. Der Zugang zu dieser Bibliothek war mehr als ausreichend, um den musikalischen Appetit des jungen Autodidakten zu stillen. Es befand sich hier Kammermusik, die von mehreren seiner Familienmitglieder gespielt wurde, wobei er die Bratschen- und sein Vater die Cellostimme übernahm, wie auch reichlich Klaviernoten, deren Studium neben seiner eher sporadischen schulischen Erziehung in der Umgebung den Schwerpunkt seiner Ausbildung darstellte. Hartys Begabung als Organist erlaubte ihm bald, sich auf Organistenstellen außerhalb von Hillsborough zu bewerben, zunächst in dem nahegelegenen Magheragall im Jahre 1894 sowie in Belfast zwei Jahre später, doch blühte sein beneidenswertes Talent als Begleiter in seiner Zeit als Organist der Christchurch in Bray von 1896 bis 1901 auf. Im nahegelegenen Dublin entwickelte sich das Musikleben unter der Ägide des italienischen Pianisten und Komponisten Michele Esposito zusehends. Dieser spielte auch bei der Gründung der Feis Ceoil im Jahre 1897, einem nationalen, wettbewerbsmäßig angelegten Musikfestival, sowie der Dublin Orchestral Society (D.O.S.) im Jahre 1899 eine entscheidende Rolle. Harty und Esposito lernten sich wahrscheinlich 1899 kennen, als Harty an einem D.O.S.-Vorspiel teilnahm. Zwar war der Italiener von den Bratschenkünsten des Musikers aus Ulster nicht übermäßig beeindruckt, doch stellte sich offenbar schnell ein gegenseitiger Respekt zwischen den beiden Männern für ihre jeweilige Musikalität ein. Obwohl Harty, entgegen seinen Behauptungen, nicht offiziell Unterricht bei Esposito nahm, legte er ihm doch alle seine Kompositionen vor und der Italiener übte offenbar einen prägenden Einfluss auf seine frühe Entwicklung als Komponist (und später als Dirigent) aus. Die Feis Ceoil spielte eine wichtige Rolle in der Wiederbelebung des irischen Kulturlebens. Dank des unermüdlichen Einsatzes Espositos verlieh das Festival schließlich Kompositionspreise, um das schöpferische Talent irischer Bürger und irischstämmiger Bürger im Ausland zu fördern. 1899 reichte Harty—sicherlich mit Espositos Ermunterung—sein erstes kammermusikalisches Werk, eine (heute verschollene) Violinsonate, ein. Zwar gewann er hierfür keinen Preis, doch hatte er im folgenden Jahr mit seinem Streichquartett Nr. 1 in F-Dur op. 1 entsprechenden Erfolg und der erste Satz des Werks wurde bei der Feis vorgetragen. Dieses Quartett war jedoch nicht sein erster Versuch in dem Genre. Im März 1898 hatte er bereits ein Streichquartett in a-Moll, vermutlich für die Feis in jenem Jahr, geschrieben, letztendlich jedoch, wahrscheinlich aufgrund mehrerer Mängel, nicht eingereicht. Bis zum Jahre 1900 verbesserte Hartys Technik sich wesentlich. Der erste Satz des F-Dur-Quartetts ist einfallsreich und raffiniert gestaltet und demonstriert in der Durchführung einen vielleicht etwas übermäßigen Ehrgeiz, neue Tonarten und Umformungen zu erkunden. Gleichwohl ist der Umgang mit dem Medium Streichquartett gewandt und das melodische Material ist in seiner Lebenslust und kontrapunktischen Geschicklichkeit ideenreich, strahlend und belebend. Das irrlichtartige Scherzo in d-Moll, das sicherlich von den ihm bekannten späten Streichquartetten Beethovens und Mendelssohns inspiriert ist, beweist mit seiner quecksilbrigen Besetzung und seinen tonalen Überraschungen wirkliche Eleganz, insbesondere im Trio. Der pastorale langsame Satz in B-Dur ist melodisch ausgedehnter und reichhaltig besetzt und mit der unerwarteten Einfügung des Scherzos in seinem Zentrum sorgt er für eine Überraschung. Das lebhafte und technisch anspruchsvolle Finale, in dem lyrische musikalische Ideen und kontrapunktisches Geschick zum Ausdruck kommen, ist ein ansprechendes, wenn auch exzentrisches Gebilde. Hartys Durchführung beginnt in erstaunlich chromatischer Art und Weise (die interessanterweise an Bruckner erinnert) und führt recht überraschend zu einer falschen, jedoch ausgedehnten Reprise des Anfangsmaterials in Es-Dur. Noch unerwarteter allerdings ist die Einführung einer völlig neuen Episode, bevor F-Dur in der letzten Reprise wiederhergestellt wird, die inzwischen die rhetorische Gestalt eines „Rondo“-Themas angenommen hat. Hartys Streichquartett Nr. 2 in a-Moll op. 5 entstand nach seinem Umzug nach London im März 1901. Dort avancierte er schnell zum führenden Begleiter der Hauptstadt und war unter den prominentesten Solisten der Zeit, wie etwa Fritz Kreisler, Harry Plunket Greene oder Agnes Nicholls (die er 1904 heiratete), sehr gefragt. Ebenso wie seinem ersten Streichquartett wurde auch dem zweiten ein Preis verliehen, diesmal bei dem Dubliner Festival von 1902, wo es am 8. Mai mit Erfolg aufgeführt wurde. Harty befand sich dabei im Publikum und hörte seinen Freunden von der Royal Irish Academy of Music, Arthur Darley, P. J. Griffith, Octave Grisard und Henri Bast, zu. Die zweite und letzte Aufführung wurde von vier bedeutenden Londoner Musikern—Alfred Gibson, Juliet Capron, Alfred Hobday und Helen Trust—am 22. Dezember 1902 in Copped Hall, Totteridge in Hertfordshire gegeben, dem Anwesen des Laiendichters und Musikliebhabers Sir Harold Edwin Boulton. Dieses Werk markiert einen gewaltigen Fortschritt gegenüber dem ersten Quartett und hat eine prominente „autobiographische“ Bratschenstimme, was insgesamt für einen besseren Fluss sorgt. Insbesondere der erste Satz beweist eine noch größere technische Beherrschung der Quartett-Anlage, doch zeigt sich dies auch in den anderen Sätzen. Das beschwingte hüpfende, gigueartige Scherzo in 9/8, in dem die Behandlung der Hemiole besonders kreativ gestaltet wird, stellt einen lebhaften Kontrast zu dem Trio in 2/4 dar. Der langsame Satz hingegen vermittelt eine überzeugendere Balance als es in dem früheren Pendant des ersten Quartetts geschieht und es erklingt zudem eine intensiv-lyrische und persönlichere Emotionalität bei dem Höhepunkt. Das phantasievolle Finale ist voll des rhythmischen Elans und weist die vielleicht komplexesten Quartett-Passagen des gesamten Werks auf, während das zweite Thema des langsamen Satzes, das hier als untergeordnetes Material verarbeitet ist, einen zyklischen Effekt erzeugt. Das Auftreten dieses Materials in dem unerwarteten und unkonventionellen Gebiet der Subdominante ist ein Hinweis auf den Einfluss Espositos; die ungewöhnlichste Einführung von neuem Material—ein choralartiges Thema in fis-Moll—jedoch, das in der Durchführung und stark verkürzten Reprise erklingt, offenbart einen völlig individuellen Zug Hartys, der sich bereits in dem entsprechenden Satz des Quartetts in F-Dur ankündigt. 1904 begann Harty mit der Arbeit an einem weiteren großangelegten Kammermusikwerk, dem Klavierquintett in F-Dur op. 12, das er zu der Vergabe eines Preises einreichte, den die ungeheuer reiche Ada Lewis-Hill, eine bekannte Philanthropin und Mäzenin, ausgeschrieben hatte. Lewis-Hill war für ihre Musikleidenschaft bekannt und stiftete etliche Instrumentalpreise an der Royal Academy of Music, besaß mehrere wertvolle Klaviere und Saiteninstrumente, darunter zahlreiche Stradivari-Instrumente. Arthur Benjamin zufolge war sie „eine Londoner Dame der Mode und des Reichtums, … Königin an einer Art Hof, dem Musiker angehörten. Zillah war eine ihrer Kammerjungfern“. Der ungarische Geiger Tivadar Nachéz und W. H. Squire, der Cellist, gehörten ebenfalls dazu. Nachéz und Squire waren zudem Mitglieder eines regelmäßig auftretenden Quintetts, dem auch der Bratscher Alfred Hobday und der Pianist Benno Schönberger angehörten, die bei den Soireen der wohltätigen Gönnerin oft das Musikprogramm bestritten. Der Preis für ein Klavierquintett, der aus der fürstlichen Summe von 50 Guineen bestand, zollte daher den treuen Mitgliedern des Quintetts Tribut, die Mrs Lewis-Hill über viele Jahre hinweg bis zu ihrem Tod im Jahre 1906 musikalisch unterhalten hatten. Schönberger, Mackenzie und Cowen waren die Preisrichter und von den insgesamt fast 40 Kompositionen wurde im Januar 1905 das Quintett von Harty zum Preisträger auserkoren. Nach einem Privatkonzert im Hause von Mrs Lewis-Hill wurde das Quintett bald darauf, am 29. Januar 1905, auch erstmals öffentlich für den „Concert Club“ in der Bechstein Hall von Enrique Fernández Arbós (dem Musikdirektor des Klubs), T. F. Morris, Alfred Hobday, Purcell Jones und Harty selbst am Klavier aufgeführt, obwohl das überlieferte Programm darauf schließen lässt, dass bei diesem Anlass nur die ersten beiden Sätze gespielt wurden. Wahrscheinlich weil der Komponist sich dazu entschieden hatte, das Werk zu überarbeiten, wurde die zweite Aufführung erst am 7. Dezember 1906 gegeben, diesmal als Teil eines Konzerts mit britischen Werken, das von dem „Concert-Goers’ Club“ im Langham Hotel veranstaltet wurde. Es war dies offensichtlich das einzige Mal, dass das Werk vollständig bei einem öffentlichen Konzert aufgeführt wurde. Hartys Quintett ist ein kühnes, kräftiges und leidenschaftliches Werk von symphonischen Proportionen und lässt sich durchaus mit den entsprechenden romantischen Kompositionen dieses Genres von Schumann, Brahms, Dvorák, César Franck, Fauré, Stanford und dem späten Elgar vergleichen. Es ist dies großangelegte Musik voller einfallsreicher Melodik, wo die Klangsprache von Klavier mit Streichquartett, die durchaus unterschiedliche Formen annehmen kann, unter Einsatz polyphoner und antiphonischer Techniken geschickt behandelt wird. Als anerkannter Pianist gab Harty dem Klavier die Vorrangstellung, so dass es mit den Streichern zuweilen wie der Solist eines Klavierkonzerts wetteifert. Hartys erster Satz ist tatsächlich überwiegend orchestral angelegt. Ein rhythmisch-dynamisches Motiv, das die Streicher im Unisono präsentieren, wird von einem ausgedehnten zusammengesetzten Thema abgelöst, das von den Instrumenten geteilt wird und das von feingliedrigen Verzierungen umgeben ist. Ähnlich wie bei Schubert endet diese recht lange Passage in F-Dur und geht dann in ein ebenso großzügiges zweites Thema über, eine pentatonische, volksmusikartige Melodie in der Subdominante, die in der tonalen Anlage von Hartys Sonatensätzen inzwischen häufig auftrat. Dieser ausgedehnte Teil schließt ebenso unmissverständlich in B-Dur, jedoch nicht bevor Harty das sich selbst durchführende Thema mit einer lebendigen, wenn nicht sogar dramatischen Reihe von Modulationen versieht, die durch das neapolitanische H-Dur und dessen Dominante Fis-Dur schreitet. Die Rückkehr aus Des-Dur, das sich beim Höhepunkt der Durchführung etabliert hat, wird eindrucksvoll bewerkstelligt und die Wiederkehr des zweiten Themas, entsprechend in Des-Dur, wird phantasievoll gehandhabt, wenn Harty die Rückkehr nach F—in turbulenter Stimmung—als neues Mittel dazu nutzt, sich den Themen wieder zuzuwenden. Die Wiederherstellung der Tonika wird durch triumphale, fanfarenartige Klavierfiguren angekündigt—die nicht an ihrer üblichen Position in der Reprise erscheinen—, ein durchdringendes Auftreten, das später durch die ruhigen Einwürfe des Streichquartetts gedämpft wird, die wiederum die nachdenkliche Coda vorbereiten, in der die Bratsche auf ihrer tiefsten und klangvollsten Saite eine außergewöhnliche Rolle spielt. Auch beim Hauptthema des Scherzos (das wiederum der Bratsche zugeschrieben ist) wendet Harty sich einer künstlichen Pentatonik zu, um ein „irisches“ Thema anzufertigen, doch ähnelt der Charakter seines Materials diesmal deutlich den Arrangements populärer Volksmelodien von Percy Grainger. Dies macht sich nicht nur in der schwungvollen Instrumentierung bemerkbar—die nicht zuletzt durch den Einsatz von Pizzicato auffallend reichhaltig und dynamisch ist—, sondern auch durch das Verwenden lebhafter diatonischer Harmonien, unkonventioneller Modulationen und Gegenmelodien, für die Grainger berühmt war (und die in Werken wie etwa Shepherd’s Hey, Handel in the Strand sowie dem irischen Reel Molly on the Shore auftreten). Hartys Struktur, eine wunderschön konstruierte Sonate, ist ebenfalls sehr geschickt verarbeitet, wobei der unterhaltsame Dialog zwischen Klavier und Streichquartett in der Durchführung und die spielerischen und unerwarteten tonalen Abzweigungen besonders kunstfertig gestaltet sind. Wenn in dem Scherzo ein irisches Kolorit bemerkbar ist, so ist es in dem expressiven Zentrum des Werks, dem langsamen Satz in a-Moll, deutlich ausgeprägt. Obwohl hier keine authentische irische Melodie verarbeitet ist, ist der gesamte Satz doch mit einer beständigen erniedrigten Septime (der parallelen Durtonart C-Dur) durchwirkt—ein Charakteristikum der irischen Volksmusik—was sowohl die Melodik als auch die Harmonik beeinflusst. Harty hatte in seiner „Irischen Symphonie“, für die er 1904 den Symphonie-Preis der Feis gewann, bereits eine Vorliebe für aufwendige Melodik gezeigt, doch tritt dies hier mit dem Einsatz von Pralltrillern, schnellen Tonleiterläufen und modalen Wendungen noch stärker hervor. Zudem bedient Harty sich sehr ergiebig der „doppelten Tonika“, wenn das umfangreiche thematische Material in aufreizender Weise zwischen a-Moll und C-Dur hin- und herwechselt. Das erste Thema endet in C-Dur und setzt die erniedrigte Septime enharmonisch ein (wobei das B als Ais notiert ist), was durch eine übermäßige Sexte eine geschickte Modulation nach E-Dur für das zweite Thema ermöglicht. Dieses zweite Thema führt sich sogar in noch ausgeprägterer Weise als das erste selbst durch und erinnert damit an die dramatischen thematischen Passagen Tschaikowskys. Es wird von der Bratsche vorgestellt und zunächst vor dem Hintergrund einer Gegenmelodie präsentiert—eine Spezialität Hartys—, doch die gewaltige, extravertierte Reprise (der Einsatz eines heroischen 6–4-Akkords, die Streicherbesetzung über mehrere Oktaven und die Intensität der triolischen Begleitung) erinnert umso mehr an den russischen Komponisten. Im letzten Satz des Quintetts ist Hartys Vorliebe für russische Musik in dem lebhaften zweiten Thema (das er unbewusst dem Ersten Klavierkonzert Tschaikowskys entlehnt haben muss) und in der äußerst unkonventionellen Episode in b-Moll nachvollziehbar, das das Herzstück der Durchführung bildet; beide Ideen verleihen dem Finale einen burlesken Charakter, der durch die ungestüme Coda noch verstärkt wird. Diese Neigung zum Exotischen und zu dynamischen instrumentalen Klangfarben sollte sich in Hartys späteren Werken immer wieder äußern, und auch seine Begeisterung für weitere russische Komponisten des späten 19. Jahrhunderts, wie etwa Mussorgsky, Ljapunow, Balakirew und Rimskij-Korsakow bekräftigen, deren Werke er als Dirigent zur Aufführung brachte.